This is the highest grade we assign to the Hostess Panels. In order for a Hostess Panel to be a NM-MT 8 it will be the entire box straight from the factory, so these panels have never been used and still have the glue on them where they were never assembled. 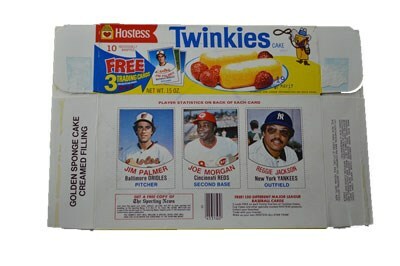 In order for a Hostess Panel to be a NM 7 it will be the entire box. These are boxes that were assembled and filled with Hostess product, so the boxes will still be attached on some sides and on the sides that are detached you will be see where the box was opened. 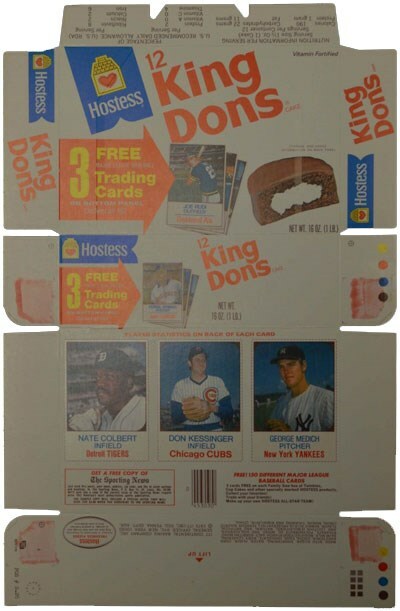 The grade of EX-MT 6 is assigned to a Hostess Panel when the actual panel of three cards has been cut from the original Hostess Box. In order for the Panel to receive this grade all of the original dashed border must be visible. 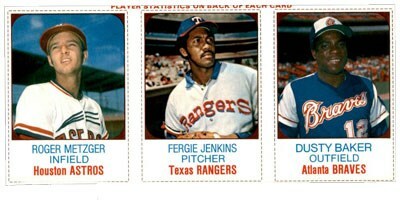 The grade of EX 5 is assigned to a Hostess Panel when the actual panel of three cards has been cut form the original Hostess Box and part of the original dashed border is missing. The grade of VG 3 is assigned to a Hostess Panel when the actual panel of three cards has been cut from the original Hostess Box and part or most of the original dashed border is missing. A Hostess Panel graded VG 3 can also show creasing and considerable wear.